Grapefruit juice is counterindicated for patients taking many different types of medications because it interferes with breakdown of the drug in the body. Wellbutrin, also known as buproprion hydrochloride, is an anti-depressant medication used in the treatment of major depressive disorder, seasonal affective disorder and attention deficit disorder. There is no known interaction between Wellbutrin and grapefruit juice. Grapefruit juice decreases the levels of an important metabolic enzyme, CYP3A, in the intestine. As a result, drugs that are normally broken down by this enzyme remain active in the body for longer periods of time. This means the patient may receive a higher dose of the medication than intended. 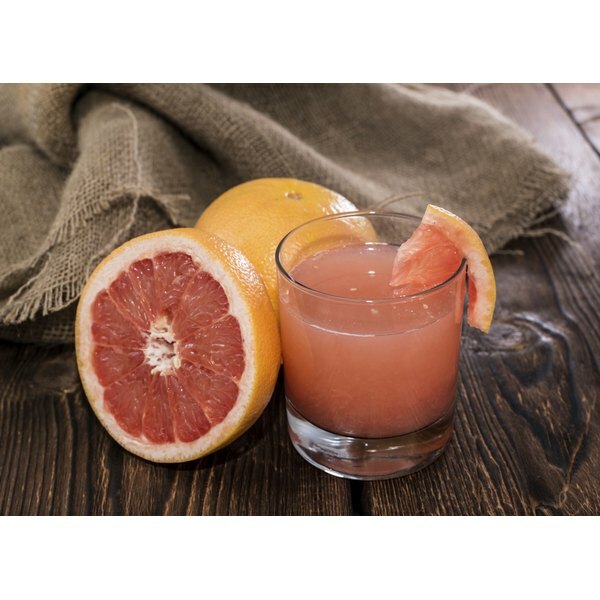 Drinking grapefruit juice while taking certain medications may cause serious side effects. Grapefruit juice does not affect the metabolism of Wellbutrin but it does interact with a variety of other medications for various conditions. Grapefruit juice should not be consumed by patients taking certain calcium channel blockers, statins and immunosuppressants. It also affects some retroviral medications, anti-seizure and anti-anxiety drugs. Dozens of drugs that interact with grapefruit juice have been identified. If you enjoy grapefruit juice, always ask your doctor or pharmacist about possible interactions before beginning a new medication. Do not drink alcohol while you are taking Wellbutrin. If you typically consume alcohol, talk to your doctor before beginning the medication. Stopping your alcohol intake suddenly may contribute to the side effects of the drug, including an increased risk of seizures. Tell your doctor about any other medications you are taking, since many types of prescription and over-the-counter medicines may interact with Wellbutrin. Although grapefruit juice does not cause adverse symptoms when combined with Wellbutrin, the medication does have other potentially serious side effects. Seizures may occur and are more common in patients taking other medications with Wellbutrin. Seek immediate medical attention for seizures, hallucinations, confusion, fever, chest pain, muscle pain and rapid or irregular heartbeat. Rash, hives, difficulty breathing and swelling in the face, throat or limbs may indicate an allergic reaction and require emergency medical help. Some patients experience suicidal thoughts while taking Wellbutrin. Contact your doctor immediately and seek medical care if you experience this side effect.